This section will go over some of the risks that Adel faces from a community perspective and how it plans to face them. Collusion ▲ While it is impossible to fully remove the chance of unethical collusion, Adel has taken measures to mitigate this risk. For example, any suspected collusion or other nefarious behavior will result in the community member being blacklisted. 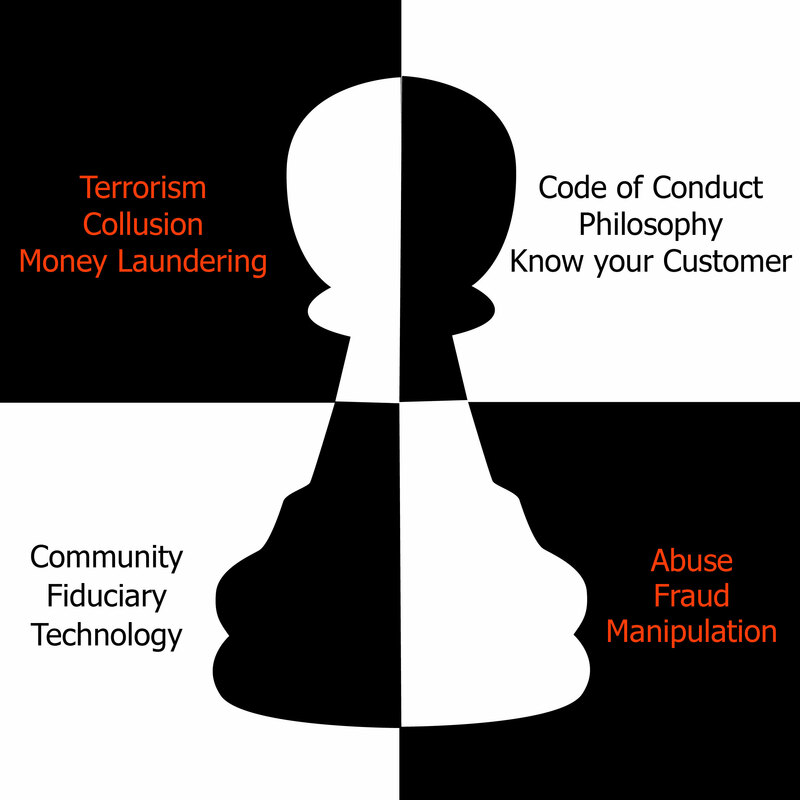 Stakeholders that collude to damage Adel in any way only serve to damage themselves as they also have a vested interest in the community’s success. The paradox is this: in order to have a significant impact on the community voting system, this individual would require a sizable amount of Adelphoi to influence the voting outcome, thus increasing their exposure and risk. Fraud ▲ A certain level of trust is necessary within the community in order to approve, launch, and operate projects. This is especially true since every action is not on the blockchain itself. As stated under Fiduciary Integrity in the next section, steps will be taken with project leaders and staff to ensure that all projects are carried out efficiently, legally, and profitably. However, the risk of members behaving fraudulently still exists. For this reason, Community Code arbitration will be established with the board’s assistance. Manipulation ▲ Voting fraud and manipulation will be eliminated by only revealing voting results after the voting window has closed. In addition, only stakeholders with a minimum amount of Adelphoi will be invited to the community to become community members. Furthermore, community members will vote based on the proportional weight of Adelphoi they hold. This will prevent fraudsters from creating multiple accounts in order to sway the community vote. Abuse ▲ Moderators will maintain order to prevent spammers from taking over a discussion for specific projects or in the Adel community’s general discussion area. These moderators will be selected in terms of their incentive to keep their respective forum discussions free from spammers, as well as their ability to do so. If an abuse of power has been demonstrated by the moderator, then the issue will be reviewed in order to determine an appropriate course of action. Community members may be blacklisted if forum rules are not met or moderator warnings are not obeyed. Confirmation Bias ▲ A confirmation bias is where people remember something in a way that confirms their own pre-existing belief. However, that belief may still be wrong. This can become an issue throughout the various decision processes in Adel where a community argument ensues because of a past decision or event. To avoid this issue, there will be a log of important events in the ecosystem, as well as a logged chat room. Furthermore, all voting decisions will be logged on the blockchain. Money Laundering ▲ This refers to income with no regulation to maximize profits for as little cash outflow as possible. Money is accumulated through illegal means and flows into socio-economically productive industries. Adel’s philosophy is to follow regulatory compliance around Anti-Money Laundering (AML), and to ensure that community participants adhere to these procedures. It is of the utmost importance that the team, the community, and the Adel brand are protected. Terrorism Financing ▲ Adel’s compliance to AML will mitigate risk to Counter-Terrorism Financing (CTF) by requiring all members of the community to be identified through AML guidelines. The exchange of financial information under CTF rules ensures the protection of the Adel ecosystem and assists law enforcement in their fight against terrorism. In this section, we will outline procedures created by Adel to mitigate harm to the integrity of its ecosystem, to Adel as a brand, and to the infrastructure created, all in order to realize Adel’s project goals. Code of Conduct ▲ The Project Review Committee will ensure that projects comply with Adel’s Code of Conduct, which includes its ethical and integrity framework, together with the Adel Board. In addition, the distribution of salaries or capital gains cannot be fully automated and will require manual actions. Where people are involved, some trust will always be necessary. Trust is inherent in the operational oversight of each project. A level of trust is established with project leaders, experts, and operational staff, in order to successfully deliver on the project’s goals. Community members will not be anonymous in an effort to mitigate risk. They will be required to reveal their identity when they enter the Adel community. Leadership ▲ The board will adhere to the Code of Conduct at all times. Any breach of the code will be dealt with a review procedure conducted by an impartial team. The results of the procedure will determine the proper course of action. All reviews will be handled on a case-by-case basis while taking into consideration previous decisions made. In more serious cases, the board can decide to suspend or remove a member. All board members and staff are required to sign and adhere to the Code of Conduct. Technology ▲ The blockchain used by the Adel ecosystem will initially be the Nxt platform, and will move to Ardor once it is deemed suitable. Because of this, the security of projects and the ecosystem itself will be dependent on the security of Nxt. To ensure platform resilience and integrity, Adel will maintain a strong relationship with Jelurida, the Nxt and Ardor core development team, as well as the community itself. In cases where Adel can be of assistance to the platform, Adel will contribute resources to protect the integrity of the platform. Community ▲ Adel will establish an open and productive communication channel with the community. Integrity will be established through a Community Code that will be agreed upon by each member as soon as they join the community. Abuse, negligence, or any unethical behavior will be investigated and may result in the community member being blacklisted from the forums, voting, or project participation. Fiduciary ▲ While Adel is working to eliminate the need for trusted third-party authorities, there are some cases where trust is necessary – especially with actions external to the blockchain. For example, the approval of projects will be initially submitted to a Project Review Committee. This will include members that have expert oversight in venture capital investments, as well as legal, operational, and technical expertise. Know Your Customer, KYC ▲ Project managers, the board, and staff members will demonstrate due diligence to the best of their abilities to ensure projects comply with legal and regulatory requirements. If further legal advice is required, the community will be solicited for their expertise and will have their credentials assessed. If none are available, then assistance outside of the community will be sought and brought in. Projects that do not satisfy legal and regulatory requirements will either be rejected or modified during the assessment process. Integrity is one of Adel’s most important values. At Adel, we are dedicated to delivering a secure and trustworthy platform for community members so they can safely participate in the ecosystem. It is important that the actions we take as leaders of the community deliver on that goal. Adel’s staff will contribute their time and expertise to continually manage and improve the ecosystem. We are committed to helping our community succeed by operating legally and ethically in accordance to any applicable laws and regulations. Adel believes that in adhering to these principles we not only protect the Adel brand, community and its members, but also serve to protect the integrity of “blockchain as a brand”, as well as innovative projects that will be introduced to society and leverage this new technology.